February is HEART HEALTH month, so why not take a look at your dinner and clean it up a bit? 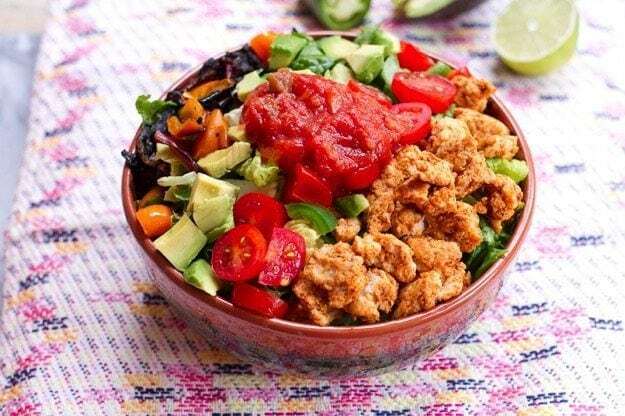 Here is a recipe that Absolute Nutrition shared with us for Turkey Taco Salad! Let us know if you try it – we know we will! Toss chopped onions and peppers with 2 teaspoons of olive oil and grill or sauté in a skillet until they reach your desired texture. Once cooked, set aside. Brown turkey in a large skillet with a little olive oil. Break meat into smaller pieces as it cooks. Cook for about 6-8 minutes or until the turkey is no longer pink. Add taco seasoning to the pan and stir to combine. If the meat seems too dry, add a little water with the seasoning. While the turkey it cooking, prep your salads. Start with a base of romaine lettuce and begin layering the toppings — tomatoes, jalapeño slices, avocado and salad. Squeeze a little lime juice onto each salad and sprinkle on chopped cilantro. Add a few drops of hot sauce if using.